The potential mechanisms underlying the increase in serum iron concentration in gamma-irradiated mice were studied. The gamma irradiation dose used was 4 Gy, and cobalt-60 (60Co) source was used for the irradiation. The dose rate was 0.25 Gy/min. In the serum of irradiated mice, the concentration of ferrous ions decreased, whereas the serum iron concentration increased. The concentration of ferrous ions in irradiated mice returned to normal at 21 day post-exposure. 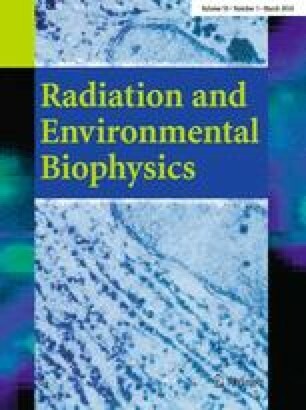 The concentration of reactive oxygen species in irradiated mice increased immediately following irradiation but returned to normal at 7 day post-exposure. Serum iron concentration in gamma-irradiated mice that were pretreated with reduced glutathione was significant lower (p < 0.01) than that in mice exposed to gamma radiation only. However, the serum iron concentration was still higher than that in normal mice (p < 0.01). This change was biphasic, characterized by a maximal decrease phase occurring immediately after gamma irradiation (relative to the irradiated mice) and a recovery plateau observed during the 7th and 21st day post-irradiation, but serum iron recovery was still less than that in the gamma-irradiated mice (4 Gy). In gamma-irradiated mice, ceruloplasmin activity increased and serum copper concentration decreased immediately after irradiation, and both of them were constant during the 7th and 21st day post-irradiation. It was concluded that ferrous ions in irradiated mice were oxidized to ferric ions by ionizing radiation. Free radicals induced by gamma radiation and ceruloplasmin mutually participated in this oxidation process. The ferroxidase effect of ceruloplasmin was achieved by transfer of electrons from ferrous ions to cupric ions. This work was supported by the NUAA Fundamental Research Funds (No. NS2014055).